The puzzle is a puzzle game in which you need to make a mosaic of many fragments of drawing different shapes. To do this puzzle very exciting experience, which you can dedicate your family leisure. You can draw or select a picture and size the parts of the puzzle: it is better to do large for a small child, and smaller for older children or even adults. Draw on a sheet of paper any picture. Also don't forget to make a copy - when mosaicking you will be able to use it as a hint. Paste the picture on thick cardboard, and then leave it to dry. Then flip the image face down. Using a ruler raschertite grid, which should consist of shapes of various sizes. With a utility knife or scissors cut along the lines a puzzle. Your puzzle game is ready. Mix the pieces and get them assembling. If you want to make a pretty big puzzle, you should seek the printout of the photo in a special Studio, working on printing large-format photos. Now, glue the printed photo to the cardboard and wait until your product has dried completely. Then trim the excess cardboard so that the edges of the photo exactly coincide with the edges of the cardboard and have the same form. Then on the reverse side of the cardboard with the help of a pencil mark where you will need to cut out parts of the puzzle. If you make a game for adults, try to make pieces more complex, and not simple geometric shapes. Use only straight lines, but the semi-circles and geometric shapes at different angles. So you see complicate the process of assembling a homemade puzzle. In printing, there are special machines that will allow you to cut your photo in different ways. This option can help you in case if you are in a hurry with a gift or you are too lazy to wield a pair of scissors, but a unique gift still want to give. When the puzzle pieces are cut, try to collect them in the original picture. This will make sure that they are sufficiently close to each other. Cut from rubber sheets of any figures that are familiar to the child, and add them to the pulp tissue. Then using scissors, cut the figures into 2-3 pieces. For kids that are not yet fully acquired the skill of folding puzzles, it is best to cut the picture into 2 equal parts. Some time later, when the baby easily would be to add image, every detail of the game to cut another 2 pieces. In addition, for the manufacture of the puzzle you can use a bright page from an old illustrated magazine, stick it on cardboard and cut into squares, triangles or other geometric shapes. Even if there is no cardboard, no problem! Use the easiest way to do the puzzle for a child – take an old postcard and tight with color illustrations and cut her to pieces. 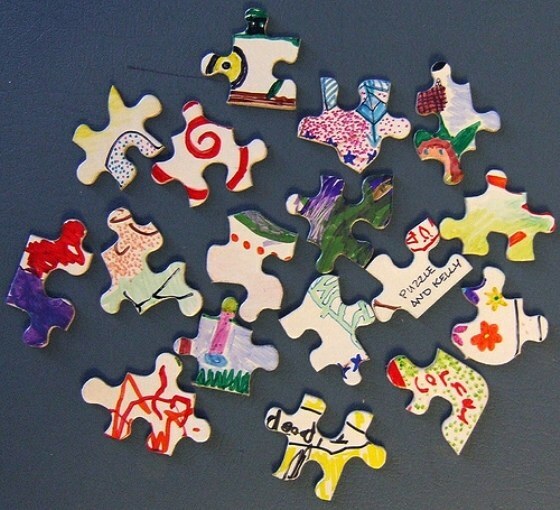 Parents are advised to put self-made puzzles in a bag or envelope, then not to look for them all over the room. This way you will be able to create your child a variety of puzzles, allowing him to develop fine motor skills and thinking.